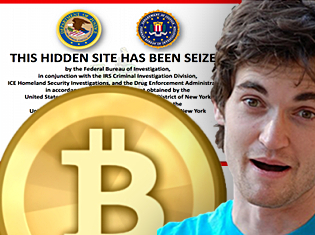 Ross Ulbricht, known as Dread Pirate Roberts to users of the SilkRoad website, was arrested last week, the FBI seized 26,000 Bitcoins belonging to Silk Road customers. But it also attempted, unsuccessfully, to claim the nearly 600,000 – thought to be worth around $80m – which Ulbricht himself is thought to be holding. Silk Road is a notorious black market website which helped dealers to sell drugs under the cloak of anonymity. Bitcoin is a digital currency based on a methods of cryptography similar to those used to protect confidential emails. Due to its decentralised nature – the currency does not rely on any centralised agency to process payments, instead relying on work done by users’ computers – it is popular for a number of fringe-legal and illegal uses. One of those uses was Silk Road, where Bitcoin was required for all transactions. 1 Bitcoin is equivalent to $138 usd. According to the FBI’s complaint, the arrest led to the seizure of $3.6 million in bitcoins—the virtual currency Silk Road users employed to buy and sell illegal drugs online. So why can’t the FBI get its hands on the money? The reason has to do with the design of bitcoins themselves. A bitcoin cannot be transferred from one user to another without the first users “private key,” or password to verify the transaction. Unless Ulbricht hands over his password, the FBI will be unable take possession of the money.